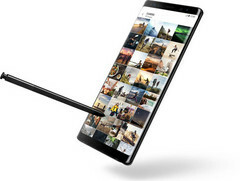 A prototype Samsung Galaxy Note 9 has surfaced in an HTML5 test. While the test does not reveal any hardware details as such, it does seem apparent that the upcoming Note phablet will be sporting an 18.5:1 aspect ratio display similar to the recently launched Galaxy S9. With the launch of the Samsung Galaxy S9 and S9+ still fresh, attention has turned to Samsung's next big offering — the successor to the Galaxy Note 8. We have not seen much information about the Note 8's successor, the Galaxy Note 9, yet but tidbits are slowly starting to trickle in. The first of these is the phablet's listing spotted on the HTML5test.com site. HTML5test.com checks for browser compatibility with all the features of the HTML5 standard and related specifications. While the test is not entirely holistic, it does give a fair idea of how developers are improving their browsers to comply with the latest web standards. The listing shows that the test was run using the Samsung Internet 8 browser running on a Samsung SM-N960U handset. This points to the fact that the N960U is very likely the upcoming Note 9. For perspective, the Note 8 was referred to as the SM-N950U. The handset is listed to be running Android 8.0.0 but we might as well see the Note 9 launch with Android 8.1 underlying the latest Samsung Experience skin. HTML5test lists the Note 9 resolution as 412 x 846. While the value seems to be a bit odd for a modern smartphone, leave along the Note 9, it is actually the test area of the benchmark. The Galaxy S9, for example, reported a resolution of 360 x 740 in one of the HTML5test scores, which we know is not the device's actual resolution. The important thing to note (pun intended) here is that the aspect ratio of the screen would be 18.5:9 — inline with Samsung's other Infinity Display offerings. Hopefully, the Note 9 sports the excellent display characteristics we've come to see in the Galaxy S9. HTMLtest is not a performance benchmark and scores should not be correlated with CPU clocks. The specifications of the Note 9 will most likely resemble the Galaxy S9 and additionally, will sport enhancements for the S Pen support. While the Note 9 was earlier rumored to sport an under-display fingerprint sensor, we know now that is not the case.